Our salt is a white crystalline sodium chloride produced by the solar evaporation of brine. Intended for use in a wide variety of end use applications, food preservation, spice mixes and food flavouring. 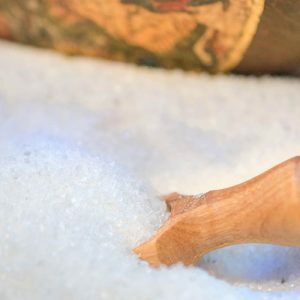 We offer a wide range of salt products for the preperation or preservation of food stuffs. Our refined salt is available in different grain sizes, ranging from 0 – 0.2mm to extra coarse sea salt with a grain size from 5 to 8mm. We deliver our products in bulk or various packaging options. For product or quote requests please send an e-mail to salt@dbgroup.co.za, we do not sell online due to constant price adjustments.